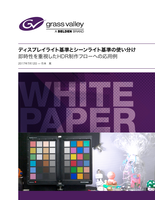 Grass Valley technologies are easy to understand with a variety of white papers that we produce on specific products or specific applications available within those products. In the past few years, live broadcasting  specifically live sports  has fostered the growth of remote broadcasting. 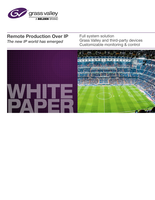 Though applications vary, remote broadcasting essentially relies on the use of IP connectivity to reduce production costs in a variety of ways. This includes not having to send staff on location, potentially a huge saving. Help is at hand. Grass Valley's Media Assurance Technology makes the necessary adjustments to the video and audio signals automatically and continuously to millisecond accuracy. This means that a highly complex problem requiring very tricky continuous adjustment can be managed without human intervention, saving on equipment costs and delivering a higher quality of service without lip sync errors. To manage this risk in advance, broadcasters should consider how the buffers in the switch work and ensure that data senders behave in such a way that the buffers never become too full. 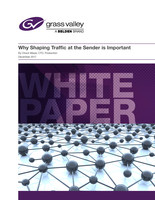 This practice is known as sender traffic shaping. 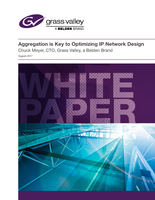 To ensure pre-compensating for this adverse effect is efficiently applied to IP, broadcasters must follow one rule: the network must be designed and managed for the desired traffic load. Shaping sender traffic is important for system reliability, and it is equally important to consider its impact for low latency and jitter in live production systems. To ensure the optimal workflow and performance, use the proposed SMPTE 2110-21 standard as a way to design the system, and then verify this, as well as system performance requirements, with your router vendor. The world of IP technology moves rapidly. The speed with which data moves through an Ethernet connection and the amount of bandwidth that connection can accommodate increases at a rate that makes network planning challenging. What makes it even more challenging? Usually, higher bandwidth interconnects, such as active optical connectors, are initially more expensive and less available due to their rapid adoption by data center and telecommunications installations. Supply eventually catches up to the demand, but costs sometimes make early adoption prohibitive. In the world of broadcast and media distribution, IP networks are being deployed to exploit the benefits that this technology presents: scalability; simplified geographic distribution; workflow efficiency; and the promise of future bandwidth increases. They are also being deployed in an effort to provide faster adoption of new media distribution services and formats as the role of traditional broadcast evolves into a more consumer choice-driven business model. Cisco's IP fabric for media solution replaces what previously was the crosspoint section of an SDI router in live production studios with an IP-based infrastructure. The Cisco Nexus 9200/9300-EX platform switches in conjunction with the Cisco non-blocking multicast (NBM) algorithm (an intelligent traffic management algorithm) provide a reliable, scalable IP fabric for the broadcast industry. In addition, this IP fabric solution provides zero-drop multicast transport and support for PTP media profiles. Live event production requires a sophisticated replay system that can fully leverage today's file-based infrastructures to deliver more than just "record and play." Replay systems should take full advantage of IT-centric open systems, being able to run on stand-alone servers or complex SAN systems with advanced metadata capabilities, while also being easy to use by operators. Ultra high IP network speeds of typically 100 GbE, coupled with very low latency, are proving to be a game-changer for transport and switching of uncompressed 4K UHD and/or HD. As such, the concept of televising a remote event under control from a centralized production studio has rapidly evolved into an attractive option. About ten years ago, following the widespread deployment of master control automation systems in the US station market, the concept of centralized operation of multiple stations under common ownership was evaluated and, in several cases, deployed. The results of these initial multistation centralizations were mixed, and a primary objective of significantly lower operating costs was not always achieved since the resultant savings in manpower proved inadequate to offset the cost of the required communications links at 1990s' rates. Nevertheless, several of these centralized projects continue in operation today, and a few have been expanded or upgraded with newer technology. Overall, however, the anticipated substantial benefits of station group centralization have not been fully realized, and broadcasters continue to look for new models to improve their bottom line through reduced costs. HDR is generally recognized as the next big thing in content delivery with an immediate perceivable benefit for the consumer. The ability to produce HDR content in HD removes the significant bandwidth requirements needed for HDR in 4K UHD and can be more quickly deployed. HDR is shaping up to be the next major advancement in the viewing experience, with consumers praising the image improvements and broadcasters working to find the best options for delivery. Grass Valley's HDR solutions allow its customers to choose the best approach for their specific production needs today, whether that be HD, 4K UHD or both, plus an easy upgrade path for tomorrow's demands with GV-eLicenses as production requirements change. Digital media ecosystems are transitioning at the speed of light to meet consumer demand for video consumption anywhere, anytime and on any device. This dramatically impacts broadcast media producers and distributors as workflows that were once facility-centric are now expected to seamlessly address and integrate with "Software-as-a-Service" (SaaS) or "Platform-as-a-Service" (PaaS) online cloud-based solutions. Systems for transcoding, targeted advertising, ad decisioning, rights management, social media, content management and online video all need to be considered for content delivery. throughput to address the demands of digital media. 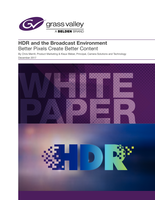 This whitepaper explains the challenges and the best possible solutions to produce native 10-bit HDR in either HD or 4K UHD, and deliver that content in HDR and SDR simultaneously, as necessary, thanks to the high-quality conversion that can be done with a downmapping process. These solutions provide native support for both of today's worldwide standard: Hybrid Log-Gamma (HLG) and Perceptual Quantization (PQ or SMPTE ST 2084). HDR is shaping up to be the next major advancement in the viewing experience, with consumers praising the image improvements and broadcasters working to find the best options for delivery. Grass Valley's HDR solutions allow our customers to choose the best approach for their specific production needs today, whether that be HD, 4K UHD or both, through an easy upgrade path with GV-eLicense if today's business model demands HD. Grass Valley, a Belden Brand, offers a portfolio of HDR-enabled solutions that includes cameras, switcher frames, servers, routers, up/ downmapping cards and multiviewers. With these devices, broadcasters are able to produce native 10-bit HDR in either HD or 4K UHD and deliver that content in HDR and SDR simultaneously, as necessary, thanks to the high-quality conversion that can be done with a downmapping process. Image acquisition for live broadcast applications faces many challenges in a multiformat landscape. The increase in spatial resolution required by 4K UHD, in combination with the additional requirements of UHD standards, including a potential increase in frame rate and high dynamic range  with good sensitivity and S/N ratio  will require some compromises and design decisions on the part of manufacturers, and camera selection on the part of camera users. Some of these new requirements, especially increased resolution, have a negative impact on some important image parameters, such as sensitivity, noise performance and dynamic range. 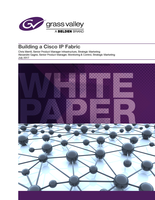 Multiple flexible solutions can address these challenges, including native format switching. 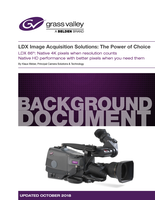 Grass Valley's industry-leading LDX 86 Series cameras provide solutions for all these challenges and uniquely provide comprehensive upgrade/downgrade paths that present flexibility that's unmatched in the industry. 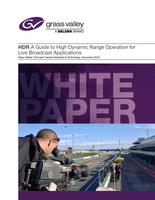 This background document will explain the latest developments in imaging technology and outline Grass Valley's latest solutions to these live broadcasting challenges. Grass Valley's sports replay solution, LiveTouch, offers new models of sports workflow that break the basic architectural model and offers users new productivity and creativity. Grass Valley has developed recording replay and editing solutions that solve all of these issues enabling production opportunities previously unavailable to customers. We have broken the "islands" model by enabling localized storage blocks to use Gigabit Ethernet networks between them intelligently and efficiently. The consequence of this is that solutions need not be designed in chunks wrapped around multicam group limitations, they can instead be designed considering inputs, outputs and operators to better suit individual program demands. At Grass Valley we are pioneering new technologies to enable Software Defined Solutions for playout, media processing, media signature technologies, remote editing, media asset management and workflow automation, supporting media companies' migration towards a software defined future. Dynamic Range (HDR) Videos für Nachrichten und Feld-Produktion einzusetzen, bei denen die unmittelbare Verbreitung des Inhaltes erforderlich ist. Ein Beispiel dafür stellt das Konzept „Instant HDR" von Sony dar, und Kameras, welche im Hybrid Log-Gamma (HLG)-Format aufnehmen können, werden auf den Markt gebracht. Wenn das Video direkt im HLG-Format aufgezeichnet wird, kann es, wenn es der Zeitfaktor erfordert, ohne jegliches Color Grading (CG) verbreitet werden. Ist es dann eigentlich nicht möglich, Kameras die im Log-Format aufzeichnen, wie etwa in S-Log oder V-Log, in solchen Bereichen zu verwenden? Ein Log-Signal muss nach HLG oder Perceptual Quantization (PQ) umgewandelt werden, damit es auf Consumer-TVs angezeigt werden kann  die Umwandlung selbst ist aber nicht schwer. Abgesehen von Liveproduktionen, können wir HDR-Clips mit nur geringer Zeitverzögerung ausspielen  nach einem schnellen Schnitt mit Cut & Paste, dem Hinzufügen von Titeln und der Formatumwandlung mit EDIUS. Um das zu erreichen, müssen aber einige Punkte beachtet werden: zum Beispiel unterscheidet sich die Farbgebung zwischen Log-Formaten und HLG. Wegen der Unterschiede im Quellmaterial hat die gewählte Einstellung der „Umwandlungsbasis" (Engl. Conversion Base) in der Primären Farbkorrektur Auswirkungen auf das jeweilige Ergebnis. In the video industry, efforts are made to use High Dynamic Range (HDR) video for news and live field production where immediate content distribution is necessary. One of such is Sony's "Instant HDR" concept, and cameras which can shoot in Hybrid Log-Gamma (HLG) format are to be brought into the market. If video is shot in HLG format directly, it can be distributed without any color grading in cases where timing is of the essence. Then, isn't it possible for Log format cameras like S-Log or V-Log to be used in such fields? Although a Log signal needs to be converted to HLG or Perceptual Quantization (PQ) in order to be displayed on consumer TVs, the conversion itself is not difficult. Leaving live production to one side, we can play out HDR clips with a short time lag after quick editing such as cut & paste, title addition and format conversion by using EDIUS. But to do so, some points need to be taken into account, for example, the concept of picture tone is different between Log formats and HLG. The "Conversion Base" setting in the Primary Color Correction has implications based on the difference of the source material. Today's broadcast video content is being viewed on the widest range of display devices ever known, from small phone screens and legacy SD TV sets to enormous 4K and 8K UHDTV displays. The growth in size and resolution is happening alongside many other improvements, in grey-scale resolution, colorimetry, 3D and, especially, higher frame rates. There is no doubt that the nature of “broadcasting” is changing dramatically. Where once it was a single, common output to all, today content owners are expected to deliver in a number of formats and business models, to a large number of viewing devices. In this paper, the author will paint a picture of where the internet based viewing experience could be taken. He will start with a deeply technical analysis of the progress and changes in modern web browsers. 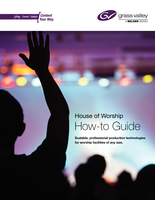 House of Worship How-to Guide: Scalable, Professional Production Technologies for Worship Facilities of Any Zize. Putting together a new production system (or updating an existing system) can seem like a daunting challenge with endless solutions to choose from. Whatever the size of your worship facilicy, this guide will help you narrow down the choices and select a system that's right for you, and that can grow as your production needs change. Below are a couple of questions to keep in mind when putting together your shopping list, because it's just as important to think about tomorrow as it is to think about today. Broadcasters and content creators are scrambling to implement systems that produce live content with the newest technological advances beyond HD, including 1080p60 and 4K UHD. In addition, particularly in live sport programming, producers are employing more high frame rate (HFR) sources, which focus on the action and highlight the drama of live events. The ability to draw the audience into the emotion of a moment in sports, such as with a frown from a player or coach, has increased demand for these HFR capture and replay devices. Regardless of how you do television, everyone agrees: We need industry-wide and universally accepted IP standards … now. Three leading industry technologists talk with NewsCheckStudio about the TV industry's IP transition. This paper seeks to offer a sensible, risk free, measured approach to an SDI to IP transition for live, real time streams. It will describe an upgrade and migration path that will allow businesses to expand in both SDI and IP based stream counts (read  router sizes) with complete interoperability between the two types of stream.